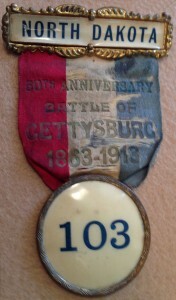 This photo is of a badge that was worn by a veteran from North Dakota at the 1913 (50th) reunion at Gettysburg. Of more than 53,000 veterans in attendance, only 165 were from North Dakota. This is one of only two such badges that are known to still exist. It is in our collection at Segway Tours of Gettysburg. That’s true. In fact, North Dakota wasn’t even a state until 1889. But the badges that were worn by veterans at the reunion designate their state of residence in 1913, not the state from which they served in 1863. Our collection of more than 50 veteran reunion & membership badges/medals will be on display at the next meeting of the Association of Licensed Battlefield Guides at the GAR Post Home on Middle Street on Friday night, September 19th starting at 6:30pm. The main speaker will be Gettysburg Ranger Angie Atkinson. Her topic will be Interpreting the Gettysburg battlefield. You don’t have to be a guide to attend. Associate Membership is available to anyone with an interest in the battle and costs only $25 per year. Heck, you’ve spent twice that much for just one book! And an Associate Membership gives you almost all of the benefits of full membership, including access to the educational meetings, seminars, book discounts, the bimonthly newsletter, and more. If you study the Battle of Gettysburg, then you should be a member! We don't need no badges! 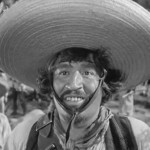 I don't have to show you no stinkin' badges!"